The FAO Food Price Index* (FFPI) averaged 176.6 points in August 2017, down 2.3 points (1.3 percent) from July, but still 10 points (6 percent) above its value a year earlier. The August decline reflected generally lower values for cereals, sugar and meat, which more than compensated for increases in the Vegetable Oil and Dairy Indices. The FAO Cereal Price Index averaged 153.4 points in August, down almost 9 points (5.4 percent) from July. After rising for three consecutive months, cereal prices in August were pressured by large global supplies. Wheat values dropped by over 8 percent month-on-month as a result of improved production prospects among exporters, especially in the Black Sea region. Export quotations for major coarse grains also fell due to ample export availabilities, especially of maize in South America. International rice prices were broadly steady, as slow import demand had offset the support provided by diminishing availabilities ahead of new crop arrivals. The FAO Vegetable Oil Price Index averaged 164.4 points in August. After two consecutive falls, the index posted a month-on-month increase of 4.1 points (or 2.5 percent), reflecting rising quotations of palm oil and other major oils. International palm oil values strengthened on smaller than expected production in Southeast Asia and steady import demand, which weighed on the replenishment of stocks, especially in Malaysia. At the same time, soy oil prices rose in response to adjustments in the United States’ biodiesel import policies that might spur domestic soy oil uptake, while rapeseed and sunflower oil values firmed on lower than anticipated global availabilities. The FAO Dairy Price Index averaged 219.7 points in August, up 3.1 points (1.4 percent) from July. Although at that level the index exceeded its year-earlier value by 65 points (42 percent), it still stood 20 percent below the peak reached in February 2014. Butter and Whole Milk Powder (WMP) prices rose in August due to reduced export availabilities resulting from greater domestic demand for butterfat in Europe and North America. By contrast, quotations of Skimmed Milk Powder (SMP) came under downward pressure due to prospects for greater export availabilities, while the global cheese market remained stable. The FAO Meat Price Index* averaged 172.4 points in August, down 2.1 points (1.2 percent) from its slightly revised value for July. At this level, the index is 8.5 percent above the level recorded last January and 18.7 percent below its peak reached in August 2014. 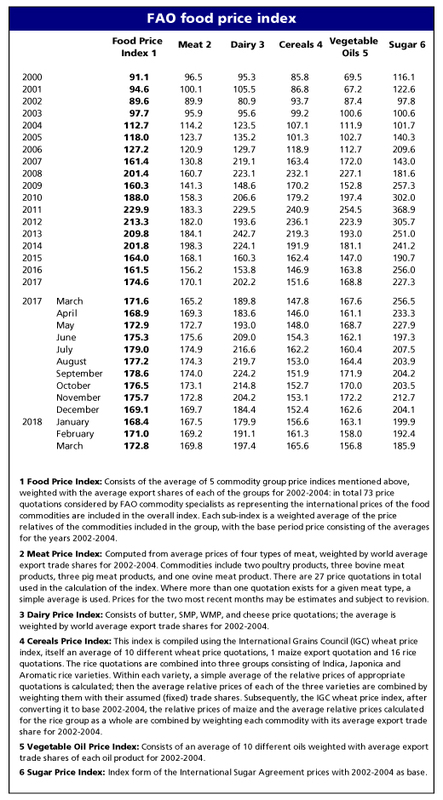 While international prices of bovine meat declined, those of pig, ovine and poultry meat were virtually unchanged. The decline in bovine meat quotations reflected increased export supplies from Australia and prospects for increased domestic supplies in the United States. While significant import demand was evident for ovine, pig and poultry meat, supplies from the main producing regions were generally adequate. The FAO Sugar Price Index averaged 203.9 points in August, down nearly 3.6 points (1.7 percent) from July. Sugar prices have been under downward pressure since the beginning of the year, with the decline in August largely driven by favourable prospects for cane harvests in major producing countries, namely Brazil, Thailand and India. Weaker international demand, in part due to high tariffs imposed by China and India, also contributed to the price weakness.